From his secret subterranean base, “Saki Inc.”, the Shredder observes a news report from April O’Neil regarding a sunken research vessel and its cargo lost at sea: one caveman frozen in a block of ice. Though the caveman is feared lost forever, the fact of the matter is that he’s already been found: by the Shredder! 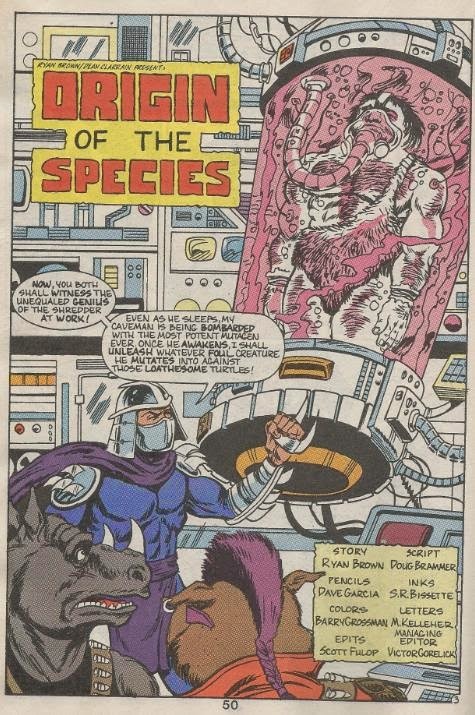 The Shredder heads to his laboratory, where Bebop and Rocksteady have the caveman suspended in a tube filled with extra-potent mutagen. Shredder intends to use the caveman’s prehistoric strength to create a newer, more powerful subordinate, but the experiment goes awry when the equipment overloads and explodes. From the smoke steps the Prehistoric Manmoth: the caveman mutated in conjunction with the mammoth skin he was wearing. To make matters worse, the Manmoth, in terrible pain, rampages indiscriminately as he proceeds to grow to enormous size. The Manmoth escapes into the city above as Shredder dispatches Bebop and Rocksteady to hunt down the failed experiment and dispose of it. Outside, the Turtles are enjoying a winter wonderland in the park. Their frolicking ends when the Manmoth bursts through the ground and begins smashing building walls. 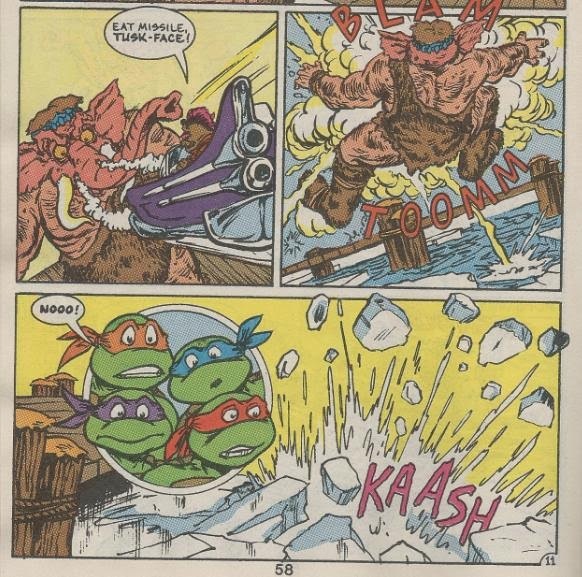 Leo, Raph and Don are quick to attack the monster, though Mike hesitates, as he can tell that the Manmoth isn’t genuinely violent, but merely in torment. Before they can calm the Manmoth down, Bebop and Rocksteady arrive in a Neutrino Starmobile. Blasting the Manmoth with a pair of missiles, the creature falls backward into an icy river. Forming a chain, the Turtles attempt to rescue the drowning Manmoth. They can’t reach, unfortunately, and the Manmoth bids them a raspy “gud buy” as he vanishes beneath the water. Bebop and Rocksteady fly away, celebrating their victory over “the monster”. The Turtles, however, stand solemnly, wondering just who the real monster was. *This story seems to fit best in the chronological gap between TMNT Adventures #4 and TMNT Adventures #5. *The Prehistoric Manmoth will return in TMNT Adventures #41 in a "flashback" story that takes place only a few months after these events. *Bebop and Rocksteady are seen driving a Neutrino Starmobile, last seen in TMNT Adventures (miniseries) #3. *This story was reprinted in TMNT Adventures #71. Of the four stories packaged in TMNT Meet Archie #1, “Origin of the Species” is by far the best of the bunch. Though short (12 pages), typical (Shredder creates yet another mutant to fight the Turtles) and a bit trite (who was the REAL monster, kids? WHO!? ), the story earns extra points for the excellent artwork of Dave Garcia, which looks and feels absolutely nothing like his previous efforts in the series, TMNT Adventures #1 and TMNT Adventures #2. 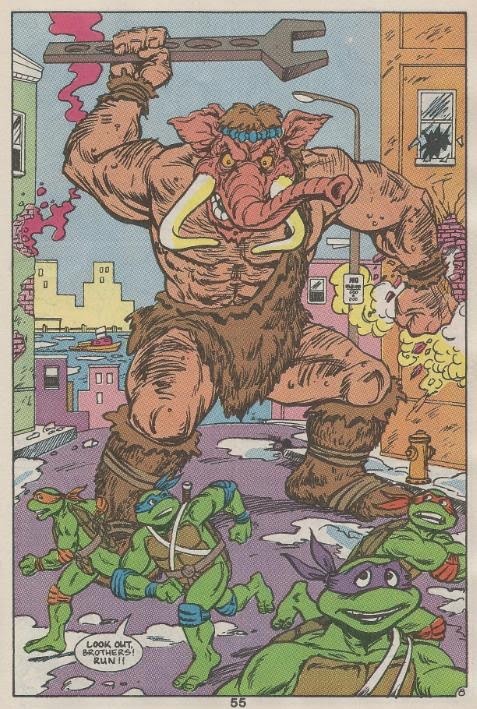 While his work on those issues was very “Archie”, lacking detail and definitely in the vein of standard kids books, “Origin of the Species” boasts a harder action-adventure edge to it, with Bebop and Rocksteady looking particularly detailed and the Manmoth anything but “cute”. Garcia works a number of visual details into his art that I appreciated. As Shredder broodingly observes April’s news report, he sits helmetless; a sight you rarely got to see in TMNT Adventures. When Bebop and Rocksteady go Manmoth-hunting, Rocksteady is wearing his helmet and goggles (used for his Playmates toy and the first season of the Fred Wolf cartoon, but discarded for seasons afterward). Bebop and Rocksteady piloting a Neutrino Starmobile was a tad odd, but they do get all their equipment from Dimension X, so maybe Starmobiles were just popular in that part of the universe. The one odd visual detail I couldn’t really reconcile is that Donatello has straps similar to Leonardo’s across his back and torso. I think it would make sense for Don to have straps like Leo’s to keep his exceedingly long weapon in place, but it’s a visual gimmick I can’t recall any other artist ever attempting; clearly not one that’s ever caught on. But where the art is a saving grace, the story is something of a dud. Doug Brammer doesn’t seem to have a very good grasp on the characterization of the Turtles, as Michaelangelo of all characters becomes the spiritual voice of reason while everyone else just wants to fight. All the Turtles speak rather awkwardly, as well, calling each other “brother” as if they were trying to remind the audience of that fact over and over again. The plot is very typical of the early TMNT Adventures issues, when Ryan Brown’s presence was as strongly felt as Dean Clarrain’s. I have a fondness for those issues, though I admit that they all had a certain air of “toy shilling” to them. Though the Manmoth never received a toy from Playmates, this story’s plot certainly fits the bill of Brown’s early issues being a string of mutant/product placement. As for its placement in chronology, well, that narrative gap between TMNT Adventures #4 (when the book was still adapting episodes of the Fred Wolf cartoon) and TMNT Adventures #5 (when it began original stories) is the only slot that fits. Bebop and Rocksteady only work for shredder up through TMNT Adventures #9, when they’re buried alive (following that, their timeline doesn’t account for them to ever be working directly for the Shredder out of his underground base again). And as the narrative between TMNT Adventures #5 and #9 is too tight to allow for this particular story to be inserted, the gap between #4 and #5 is all that’s left. As it stands, there’s a big leap in storytelling between those issues, as the book dropped all subplots from the Fred Wolf cartoon adaptations and began its own unique one’s. That blank slate of a time period allots for just about any adventures you can think of, so placing “Origin of the Species” in there works out nicely. Overall, “Origin of the Species” is a case of impressive art complimenting a rather dully plotted and awkwardly scripted story. But even so, I find it an enjoyable ride that could’ve easily been a full issue of TMNT Adventures and benefitted from that treatment exponentially.